An intriguing entrant to the robo-advisory arena is Acorns, an SEC Registered Investment Advisor. The idea behind this firm's approach is to enable investors to “invest the change” (aka “acorns” or relatively small amounts of money) that will build over time into a sizable portfolio. I opened an account to try its service and learn how Acorns works. Small change and larger amounts are invested in portfolios that are diversified among stocks, bonds, and real estate. I can approve the portfolio suggested to me or choose one at a different risk level, and then accumulate funds inside one of these portfolios. The concept is brilliant but the details of execution can be confusing and cumbersome. Still, if I want to manage tiny bits of money, invest on impulse, and slowly build a diversified portfolio, I can use Acorns. 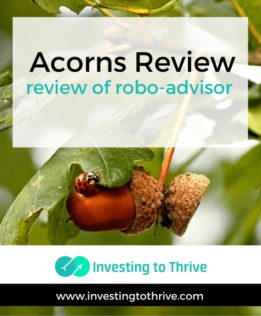 In this Acorns review, I'll cover how to use this service and give my take on this robo-advisor. Getting started is relatively easy. There are two phases to the sign-up process: 1) account sign-up and 2) opening of an investment account. I got started by signing up for an Acorns account. This process involved submitting my name and email address, creating a password, accepting a lengthy agreement, and confirming that I am 18 or older. Next I responded to a series of prompts that allowed Acorns to develop a custom portfolio for me. These questions focused on my investing purpose and timeline, employment status, annual income, and net worth. Based on my responses, I received a suggested portfolio. Though portfolios are classified by risk profile, I was not asked specific questions about my risk tolerance, such as “did you buy, sell, or hold during the 2008 recession?” as many advisors ask. (I “held” by the way). Add a funding source.This source is my checking account from which Acorns withdraws money to fund my investments. This account also receives my withdrawals, should I decide to take money out of my investments.Even when I invest the money from rounding up charges, investment funds come from this source (my checking account), not from the source of the rounding up (my credit cards or debit cards).Note that Acorns makes it easy to add a funding source. If I banked with a large institution, I could simply enter my username and password to link the accounts. Since I use a credit union and community bank, I just enter the bank routing number and my personal account number to set up the connection. Add round-up accounts. The next phase involves adding accounts from which to round up purchases to the next dollar. Add credit cards and debit cards here, again by entering my username and password to link the accounts.Add as many or as few accounts (or even none) for rounding-up purposes. Set up the Acorns account with a specific portfolio.Finally, set up an investment account, not just a sign-in account with Acorns. Answer questions that are necessary for establishing a brokerage account, such as my full name, mailing address, and social security number.Again, specify my financial goals and get a portfolio suggestion. Then, accept the recommendation or choose a riskier or less risky portfolio. At this point, I'm ready to fund the account. The initial set-up is simple but more involved than many other robo-advisory firms. However, the fast linking of accounts is a nice, user-friendly touch that may allow me to get started quickly and easily. The portfolio design is based on Modern Portfolio Theory, which suggests that investors can earn a given investment return at a certain risk level by investing in a portfolio that is diversified among uncorrelated asset classes. Such a portfolio may include asset classes, such as stocks, bonds, and real estate; and sub-classes such as U.S. large cap, U.S. small cap, and international stocks along with corporate and government bonds. Notably, Dr. Harry Markowitz, the Nobel Prize winning economist and father of Modern Portfolio Theory (MPT), sits on the firm's investment committee. Most robo-advisors and many financial advisory firms reference MPT's principles as a foundation for constructing its portfolios. To learn more about Acorns' application of this investment methodology, see its white paper. Based on my experience with the firm's website, each portfolio contains low-cost ETFs representing desired asset classes and sub-classes. Allocations of asset classes and ETFs differ depending on the risk level. I can choose among five portfolios classified along a continuum of conservative to aggressive. I can't easily tweak the weightings or ETF selections. However, according to the program agreement, I can request an exclusion of an ETF by emailing MyExcludedETF@Acorns.com. On its home page, dashboard, and mobile apps, Acorns illustrates a hypothetical projected growth of investments, given a certain monthly contribution and risk level (and based on past peformance) when presenting its portfolio choices. The numbers displayed indicate a projected dollar amount while the shaded areas represent expected possibilities for making money and losing ground. Generally, portfolios with more risk are more likely to fluctuate between two extremes than portfolios with less risk. I can play around with various contribution levels and risk levels to get an idea of expected outcomes in terms of saving for a specific goal with a stated time horizon. There is no minimum to simply create an account. But to start investing, I must invest $5. Plus, subsequent investments must be at least $5 and can be as high as $10,000 on a daily basis. This $5 minimum applies to round-ups or acorns; small amounts are accumulated and then invested when the combined amount of round-ups passes the $5 threshold. Fees are charged monthly. Low-account balances are charged a fixed dollar amount and larger ones pay a wrap fee based on assets under management (AUM). If my balance is less than $5,000, I'll pay the lower amount of 1) my account balance or 2) $1. So, if I have 40 cents in my account, then Acorns will charge me 40 cents for its service, bringing my account value to zero. But if I have $100 in my account, $1 will be deducted monthly. This structure typically amounts to a $12 annual fee on low-balance accounts. Those who have $5,000 or more pay .25% of AUM annually, prorated and charged monthly. Lump-sum or one-time investmentsWhen I open the account, I can choose an opening deposit amount. I opted to make an initial investment of $5.After the account is open, I can invest lump sums from a minimum of $5 to a maximum of $10,000 on a daily basis.I can also accept the firm's offers that appear on your dashboard. Perhaps Acorns wants to capitalize on the impulsive nature of its customers. Investing may be a better response to impulse than wasteful spending, as long as I don't need that money to pay bills. Recurring investmentsI can set up recurring investments on a daily, weekly, or monthly basis. Again, the thresholds are $5 minimum and $10,000 maximum. Invest rounded-up amountsThis investment method is the core of the firm's philosophy involving the investment of small amounts of money, which over time could build to a sizeable portfolio.There are multiple steps to investing round-ups. First I need to link credit cards and/or debit cards; transactions on these cards provide the basis of rounded-up amounts from which to build. To initiate this linkage, I'll select the card's sponsoring bank presented by Acorns and enter my username and password for the card account.Next decide whether to invest round-ups automatically or manually. Using the manual setting, I must approve individual rounded-up amounts to be invested after each transaction. For example, let's say I charged lunch for $8.52. Next to this transaction on my dashboard, I'll select the amount of $.48 to be invested. If I choose to invest automatically, I'll see acorns next to the $.48 indicating its automatic inclusion for investing.Also, I've noticed that transactions of whole dollar amounts have a rounded-up amount of $1 next to them. For example, if I have a recurring charge of $10 for a subscription service, then the round-up is $1 (not zero as I might suppose). I can change the amount being contributed (or suggested) by one-cent increments from $0.00 to $1.00. Again, it makes sense to check and adjust the settings to my liking.Finally, the rounds-up are invested only after I have accumulated at least $5. At this point, the money is deducted from my checking account (the funding source) and applied to my investment portfolio. The app guide is helpful to understanding how various settings work. Note that an investor can adjust settings via the computer's dashboard (which I did) or the mobile app. Acorns manages the investments within the account. The firm also rebalances your investments to maintain asset allocations consistent with the model portfolio you have chosen. Further, dividends earned are reinvested on my behalf. Rebalancing is initiated on roughly a quarterly basis if ETFs fluctuate by 5% more or less from the intended percentage allocation. Rebalancing also happens when I make new contributions, receive dividends, or change the risk style of my portfolio. For various reasons, my portfolio may become misaligned with the model portfolio, particularly if I make frequent withdrawals or changes to my portfolio type. Managing my account as an investor largely involves making a one-time selection of my risk level and portfolio and managing the flow of transactions from (and to) my funding source. When I have a cushion in my checking account or monitor the balance closely, I may not have a problem with random amounts of money being withdrawn and invested. But when I don't have a margin in my checking account, I could be unpleasantly surprised when transfers take place. I can monitor investment performance, make contributions, request withdrawals, and perform related tasks from my computer's dashboard or the mobile app. Acorns offers a taxable investment account only. Though I can save for retirement using Acorns, I can't open a traditional IRA, Roth IRA, or IRA rollover. I can withdraw my money without penalty at any time. However, transfers of money to my checking account may take several days. For pocket change, all of this manuveuring seems like a lot of work. Still, it is laudable that the firm has safeguards in place to prevent me from accidentally moving a ton of money from my checking account to my Acorns investment account simply because I make a bunch of random purchases that generate withdrawals for investing purposes. And the portfolio design is desirable for a simple, ETF-based diversified investment portfolio. Though attending to all these details is not for me, Carl Richards, New York Times columnist and Certified Financial Planner, likes that it's easy to pull the investing trigger. And, if you’ve ever said “I wish I had [fill in the blank with a dollar amount] every time I heard [fill in the blank with an annoying occurrence], you could follow his lead and build a nice portfolio by investing $5 whenever the markets get noisy. Those who like to be prompted to invest and find investing small amounts regularly to be attractive may enjoy investing with Acorns.